4310 Achras (manilkara) zapota - Sapodilla Hasya, Air-layered ? Q: What is an air-layered plant? Air-layering is a method of vegetative (or asexual) propagation woody ornamentals and fruit trees, when branches, while still attached to the parent plant, start producing roots where they come in contact with a rooting medium. Minimized water stress and stable nutrient levels make this method successful. Air-layering is used when grafting is not possible for a number of reasons. 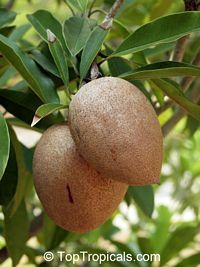 Sapodilla Hasya - extra large, football-shaped fruit native to Mexico where it is the number one commercial cultivar grown. The fruit is of excellent eating quality and it has a reddish hue throughout the pulp. The tree is a large upright grower, and it is a prolific producer of large fruit that typically weigh thirteen ounces. The fruit ripens from November to June.